Welcome to the Sheffield Green Party Website. If you are already registered on this site, please use the form on the left to login. All new user, please click below to register. You will be redirected to our registration page. Your password will be emailed to you shortly after registration. Font not the right size? Local residents including members of both the Green Party and Labour Party, have united to challenge plans to make Norfolk Park Road one way. (see previous post here). The planning meeting will be on Thursday 9 June at 2.00 in the Town Hall. Unfortunately I will not be able to attend as I will be at work. If you have any comments or suggestions please reply to this post and I will forward them to Frank Abel who is coordinating the objection. 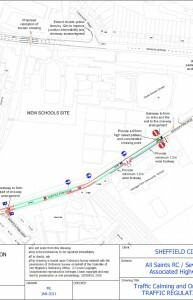 Following publication of the proposals for changes to Norfolk Park Road, the committee of the Friends of Norfolk Heritage Park and other local residents asked for a meeting with planning officers, and this was held on 15 March. Minutes of the meeting were afterwards circulated to all who attended. We were informed only 330 households consulted in narrow local area, and officers agreed at our meeting it should have been wider. A resident living only 100yards from Norfolk Park Road received no invitation. Limited consultation reduces validity of 74% vote by residents quoted, which was not in favour of 1-way, only of the uphill direction rather than downhill. 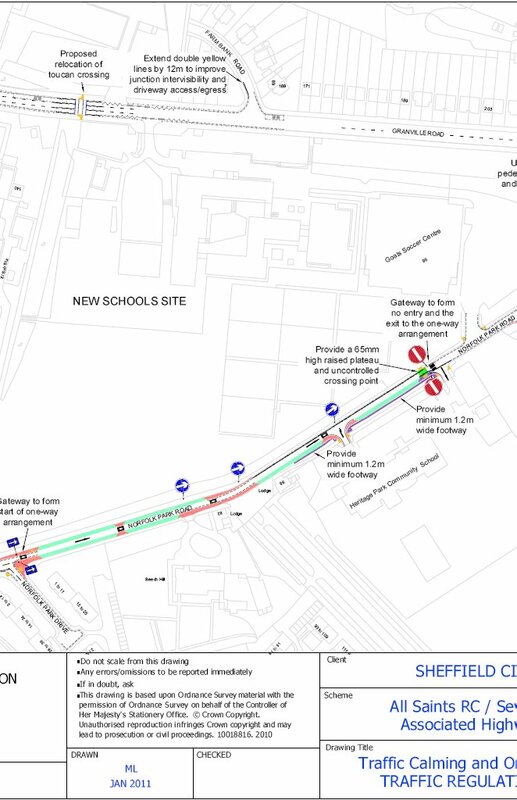 Transport Assessment carried out for new school development actually expects ‘fairly limited increased generation of traffic’. What it wants examined is traffic calming measures for Norfolk Park ERoad and pedestrian crossing arrangements for Granville Rd. It advances no arguments for 1-way and officers stated at the meeting they didn’t know why the proposal had been made on the basis of that assessment. 1-way creates need for drivers to divert, adding many extra vehicles to Granville Square, already congested at peak times, and more CO2 emissions. School access through Goals is 1-way through school grounds exiting on Granville Road just where congestion is most severe. Proposal seems to accord priority to parking, rather than road users. No residents park on this road, which has no houses on it. Parking is predominantly from City College students, (which is well provided for with public transport, including tram bus and train), football fans visiting Bramall Lane and overspill from the Goals complex. Our suggested scheme (briefly: traffic in both directions, 3 areas for parking on NE side, double yellow lines whole of SW side, 20mph speed limit or speed humps).